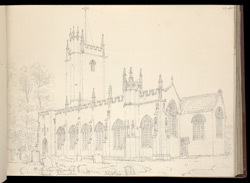 The Church of St Gregory, as seen in this drawing, was rebuilt in 1438. It replaced an earlier church of which no remains survive. By the time Buckler visited Dawlish, St Gregory's had fallen into a dilapidated state. Five years later, in 1825, the old church was pulled down and rebuilt.